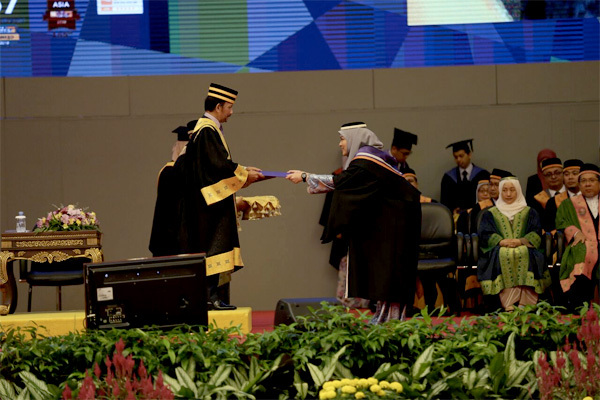 His Majesty the Sultan and Yang Di-Pertuan of Brunei Darussalam handing out a certificate to one of the UTB graduates. 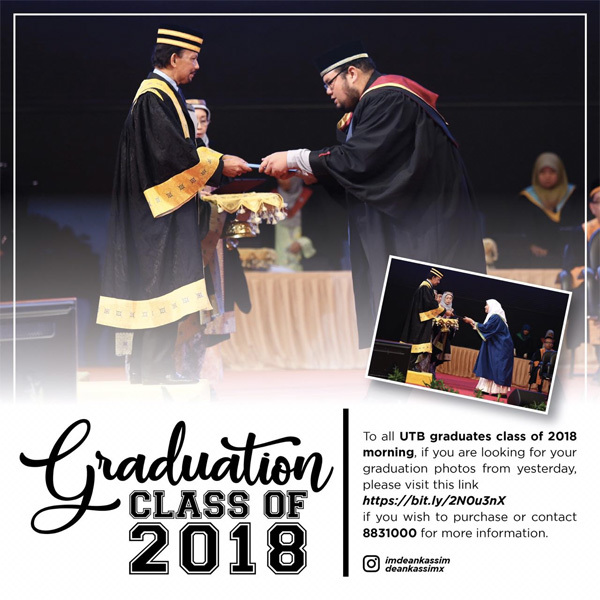 Congratulation to all the graduates of UTB’s 6th convocation. 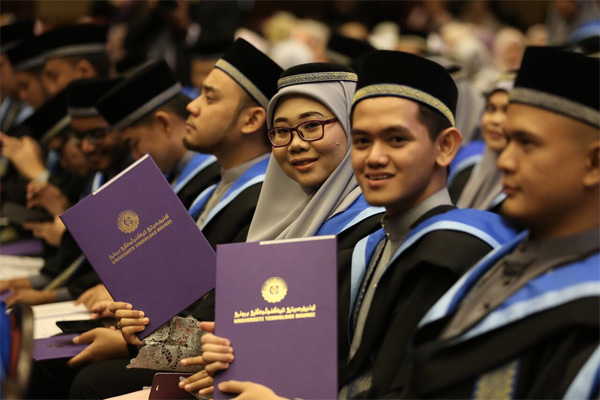 Gracing the ceremony was His Majesty the Sultan and Yang Di-Pertuan of Brunei Darussalam where 461 graduates compromising of Master’s Degree, Bachelor’s Degree and Level 5 Higher National Diploma graduates, being held at the International Convention Centre. 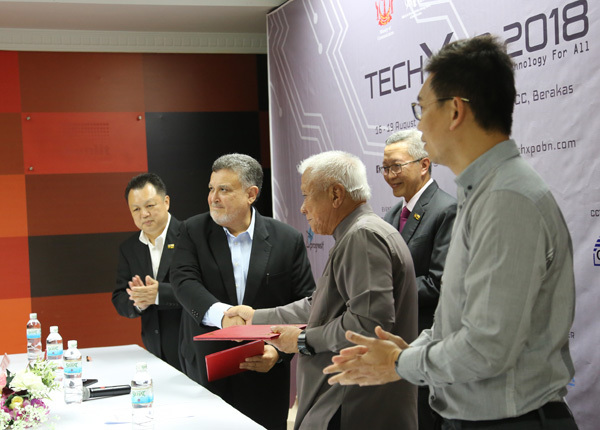 Technology was highlight in His Majesty’s titah in welcoming an establishment of a new research centre designed to boost national agricultural capacity through the means of technology. The centre will be called CrAFT which stands for Centre for Research on Agr-Food Science and Technology. His Majesty was also pleased with UTB’s milestone as it was listed at 442nd place on the Quacquarelli Symonds (QS) World University Rankings. 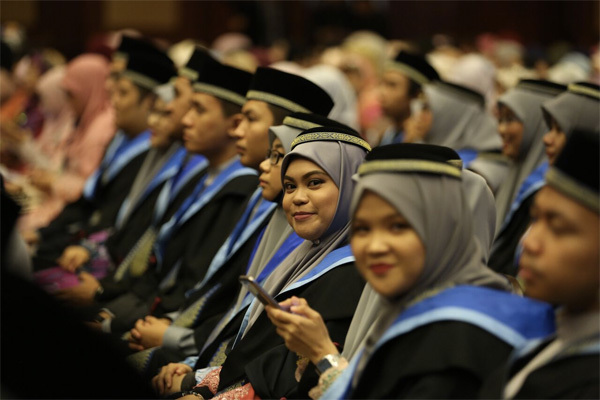 It is also rated as a five-star university by QS and ranked 57 for Young Global University under 50 years of age. 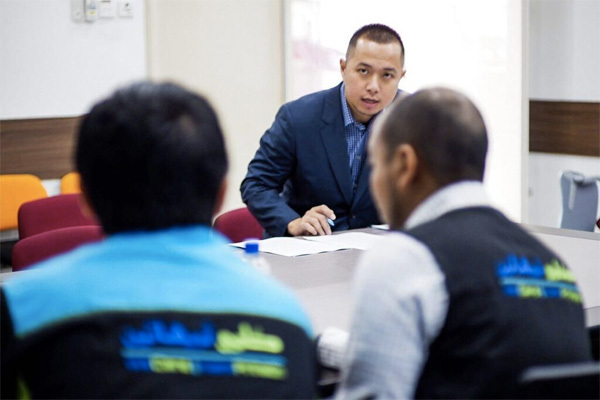 Earlier this morning, a press conference was hosted by WeCare, a small NGO consisting of 8 members. The press conference was to highlight the fund raising campaign called “Syrian Warm Winter”. They will be departing for Turkey on 15th October 2018 according to the press conference held at Knowledge Hub. Present during the press conference was His Excellency Mehmet Suat Akgün, the Ambassador of the Republic of Turkey to Brunei Darussalam. His Excellency expressed his support to WeCare’s on-going efforts in providing aid to the Syrian refugees who are based in Turkey. “Turkey pursues a humanitarian foreign policy and takes concrete initiatives to promote stability and prosperity in its region and beyond. According to the Global Humanitarian Assistance Report, Turkey ranks the biggest donor country world-wide with its USD 8 billion humanitarian assistance in 2017 and furthermore, Turkey maintains its position as the country’s largest host of refugees,” shared His Excellency Mehmet Suat Akgün. 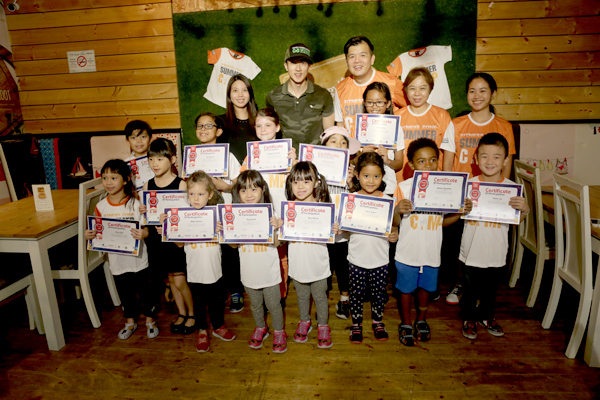 According to the press release, this is WeCare’s second visit to Turkey in giving out aids to the Syrian refugees. 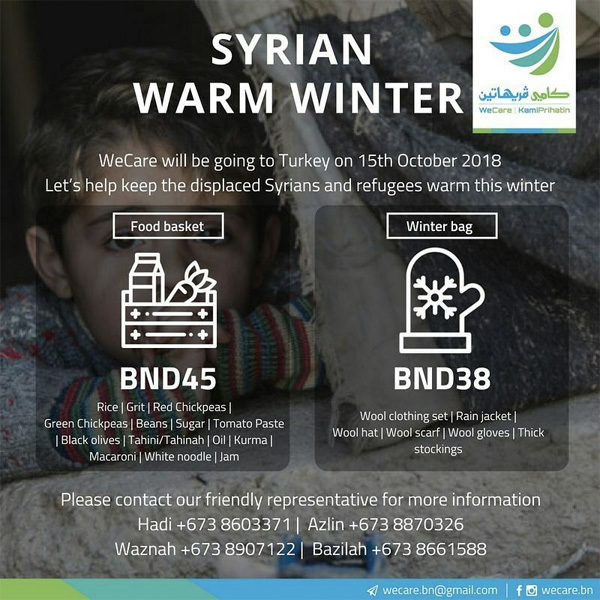 Hj Rusdi Asdani bin Hj Jorsni, the President of WeCare, highlighted that the Syrian Warm Winter initiative aims to raise funds from the public to purchase basic food and necessities such as rice, sugar and cooking oil as well as warm clothing. These items will help to ease the burden of the Syrian refugees during the winter season in Turkey. Older people have always played a significant role in society, as leaders, caretakers and custodians of tradition. Yet they are also highly vulnerable, with many falling into poverty, becoming disabled or facing discrimination. As health care improves, the population of older people is growing. Their needs are also growing, as are their contributions to the world. 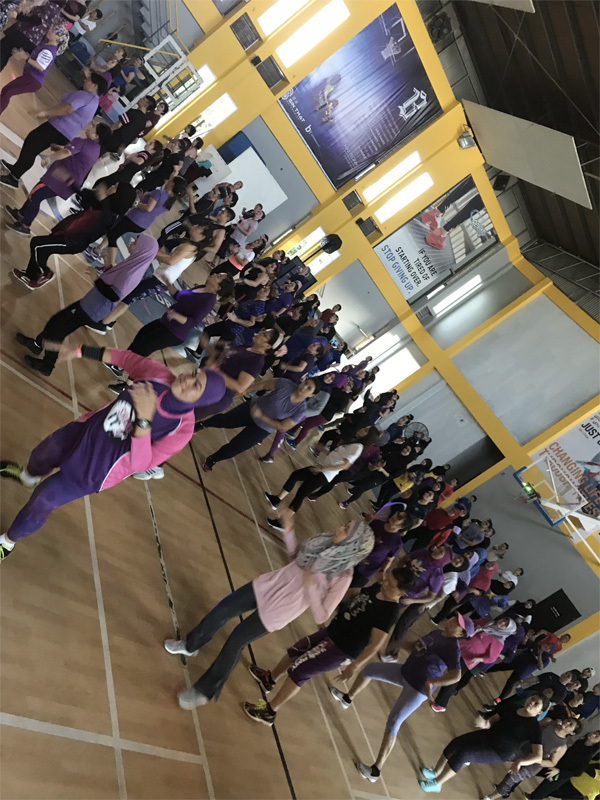 Fitness Zone Brunei supporting these endeavors and addressing the phenomenon of global ageing, actively promoting the adoption of wellness support for older people and meet their needs. “The first of October, the International Day of Elderly. 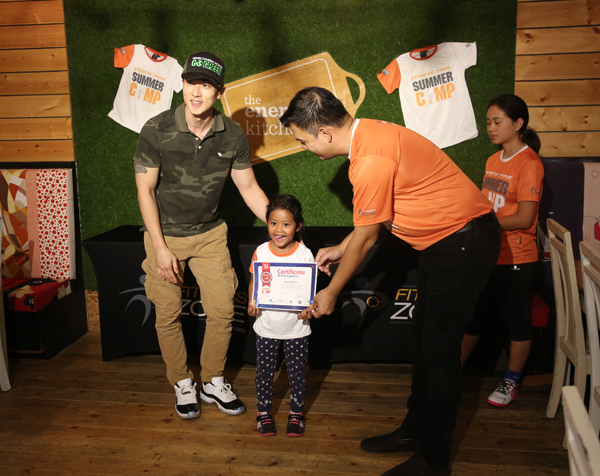 We commemorated in conjunction with our 3rd leg of fund raising event with Puhsat Ehsan, for a day to stand against ageism and to promote the development of a society that is hospitable to people of all ages.” Commented Wu Chun, Managing Director and owner of Fitness Zone. 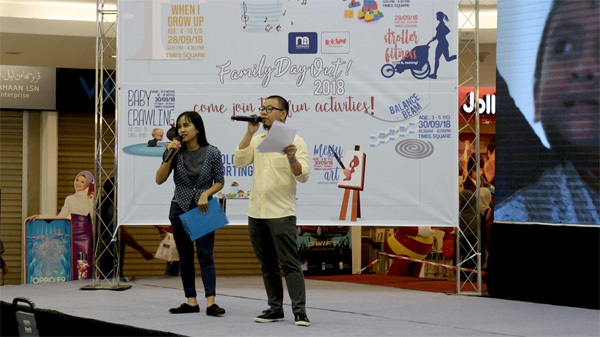 “In this event, we want the public to know that in living a fit life, age should not restrict us. 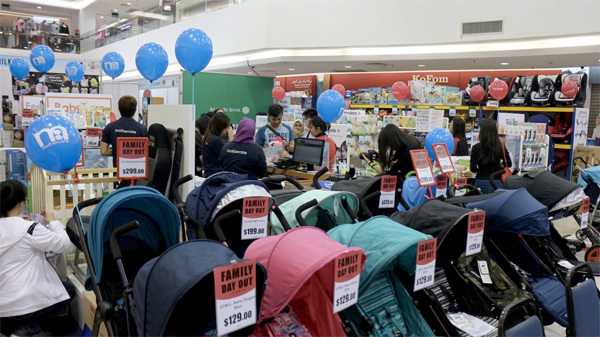 Options may be limited, but it (age) should not be a hindrance. Simple stretch and a brisk walk, guided movements are sufficient. Just keep our bodies and mind active.” He added. 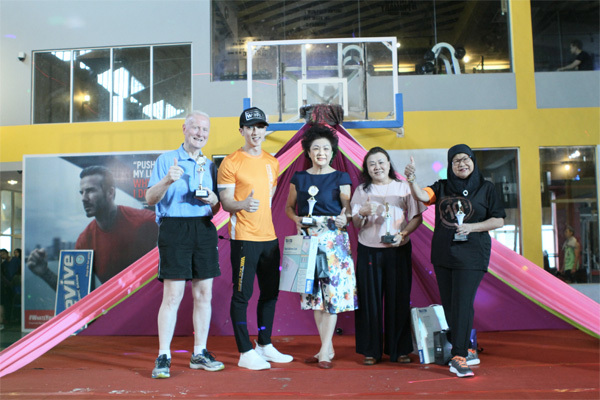 25 Senior members of the club above 70 years old were recognized and given awards presented by Wu Chun himself for their commitment and setting good example to the younger generation. 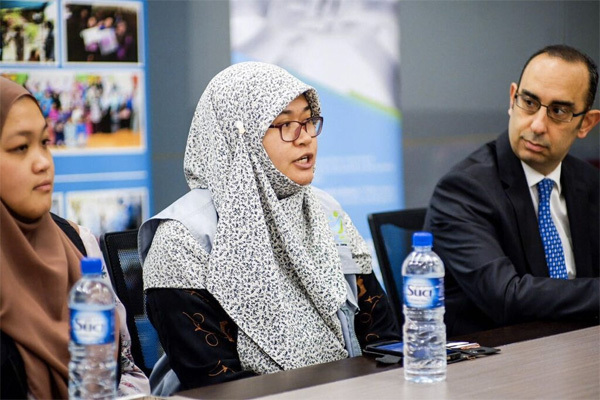 Present also were Demensia Brunei team led by Datin Jacqueline Wong, and Dr Teo from Ministry of Health and tackled the generous advocacy on the importance of good health and risk reduction of illness and active ageing. 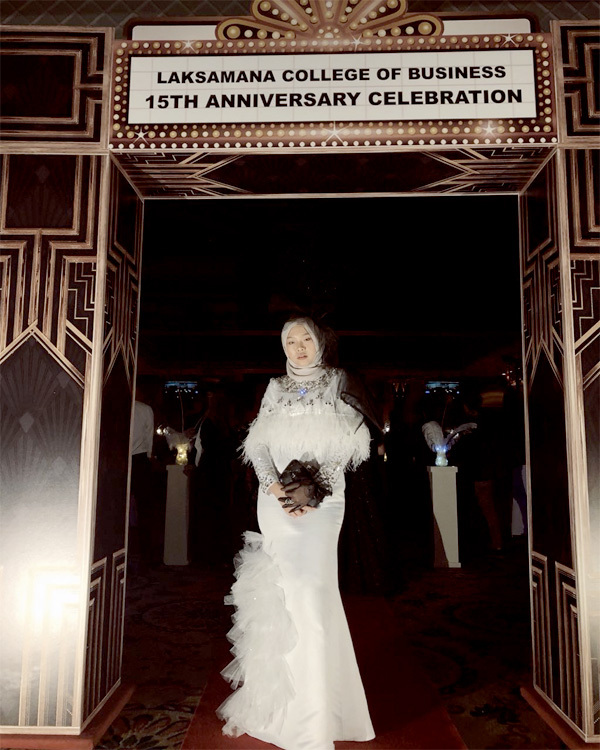 Hjh Haziah Binti Dato Hj Azar, one of the 25 elderly awardees during the event commented om a statement “I have always considered as my second home. I have not come only to workout but to meet friends and have a great time. 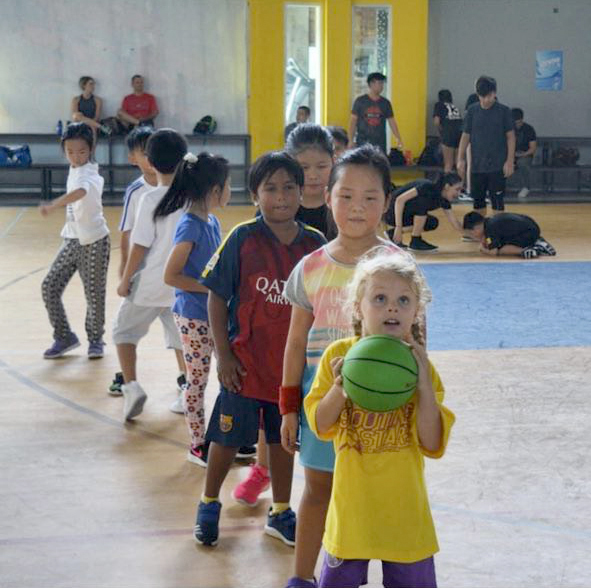 Some of my truest friends I met here at the gym.” Hj Azar commented. “That is what life is all about. Making friends. I have tried a lot of gyms in Brunei and here in Fitness Zone, hose to stay because it promotes joyful, harmonious friendly and happy environment. She concluded. 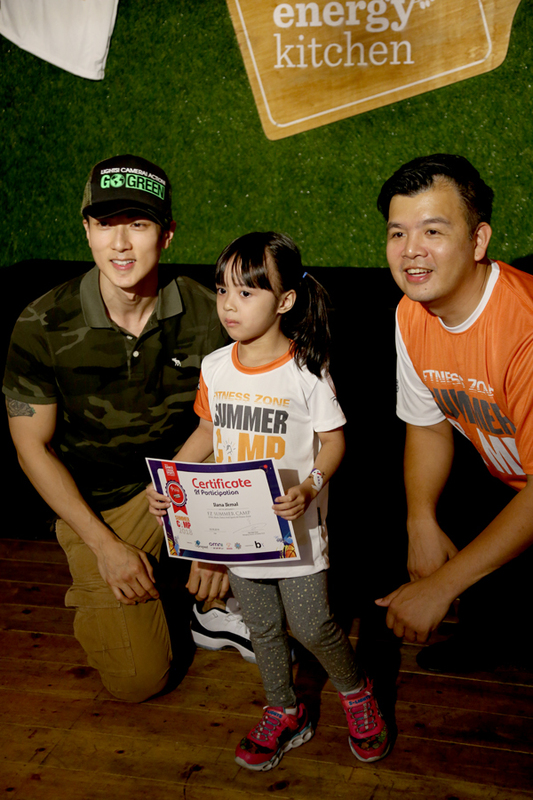 Wu Chun is currently the Demensia Brunei and ASEAN Goodwill Ambassador. 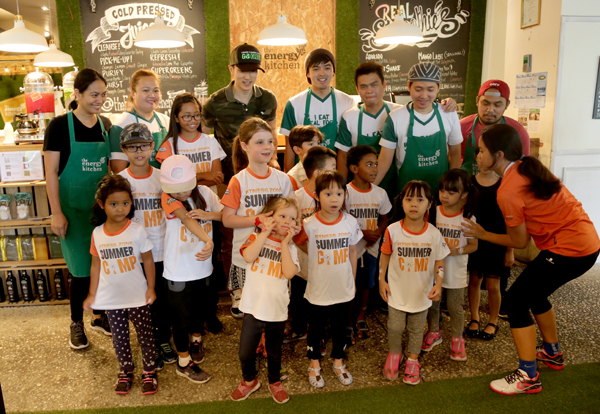 The International superstar is very passionate for community services and active involvement and he uses his influence to make change and be the voice of advocacies that needed to be heard. 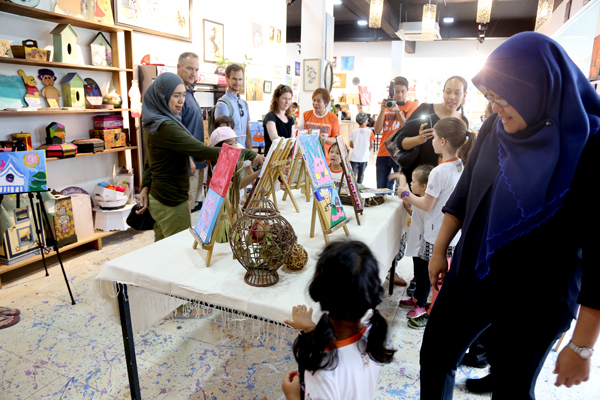 Jerudong International School once again celebrated Peace Week, a spectacular combination of educational, artistic and recreational events, designed to celebrate the United Nations International Day of Peace. 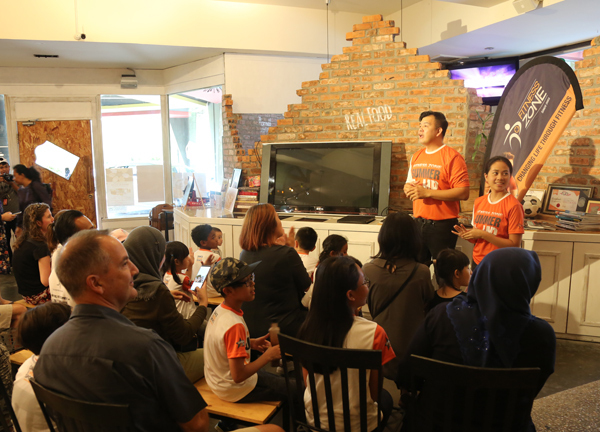 The week was led, planned and coordinated by the Head Girl, Rania Teguh and Head Boy, Jacob Hill. They spoke in detail about the week in a recent interview on Progresif Radio with DJ Jenny Malai. The week commenced with peace themed activities and videos in tutor periods on Monday. The focus was on the UN Sustainable Development Goal 16: To promote just, peaceful and inclusive societies. 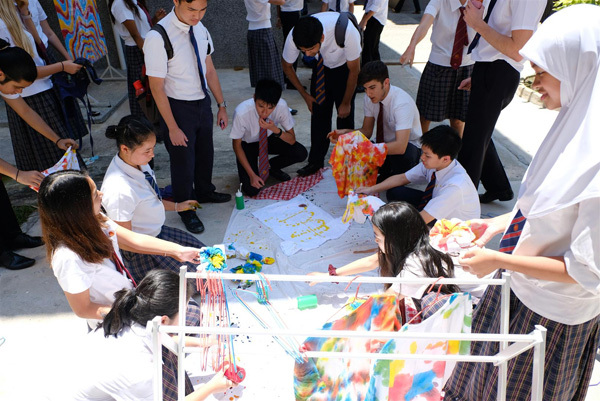 Monday lunchtime saw Senior students participate in a peace themed chalk drawing event. 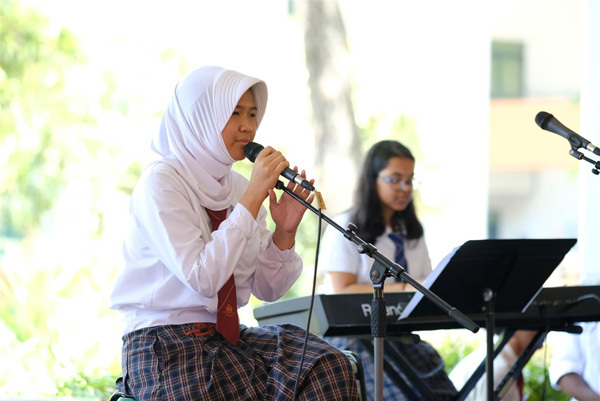 Music with a focus of peace was performed by students during lunchtimes through the week. 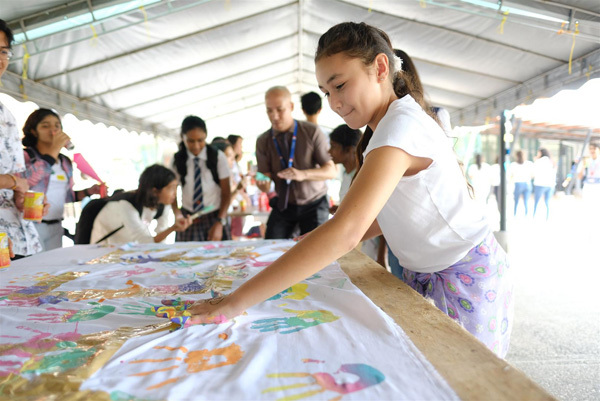 On Wednesday, students could choose to pay B$2 to wear clothes including white to symbolise peace. 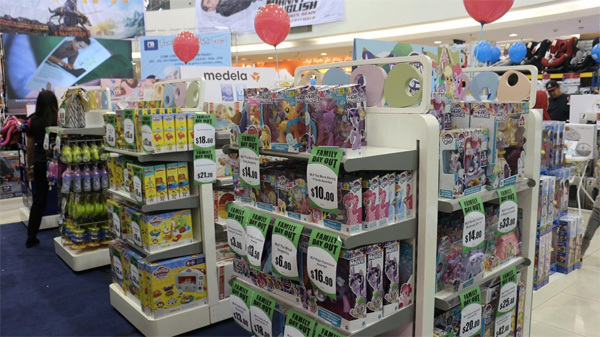 Monies raised from this will be donated to the charities which the School supports including the Polio Points initiative. The extended lunchtime included a number of outside vendors coming into school to sell their products. 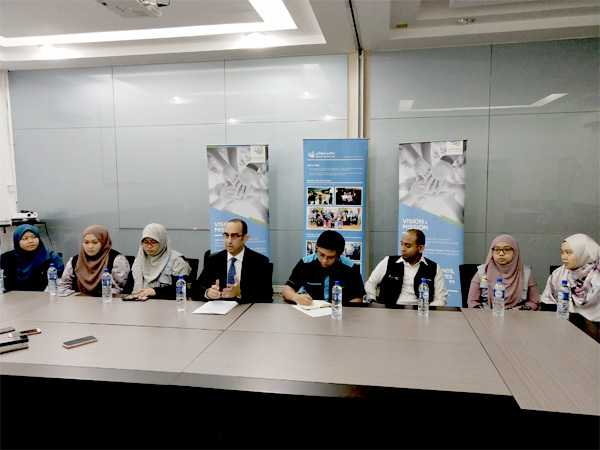 The students had carefully included several new and start-up companies. A ‘Peace Museum’ was set up by the students as a display to encourage and challenge students about the UN SDG 16. Random Act of Kindness Day was Thursday! 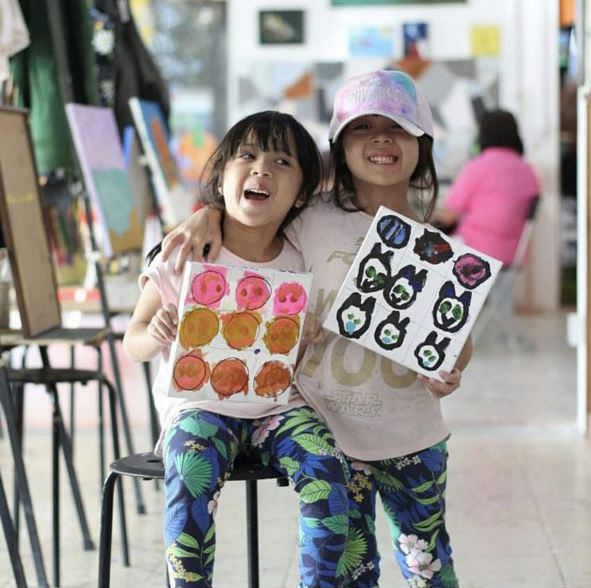 This was the launch of a new “Kindness” project to encourage students to consider others. Administration staff were delighted to receive cookies with “Thank you” on from senior students! The week culminated in Peace Themed assemblies planned and led by the student leadership team. 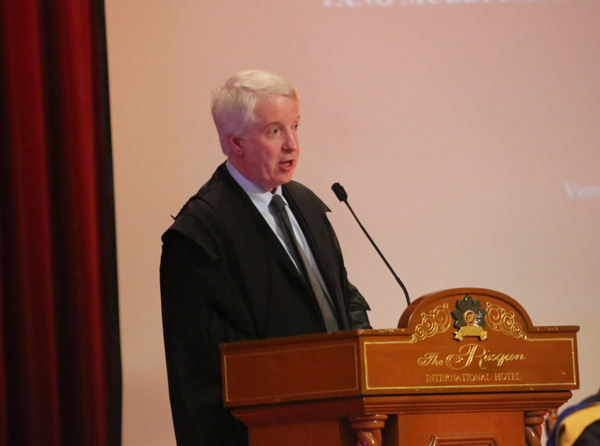 The School’s Principal, Mr Barnaby Sandow said: “Peace Week is a unique and special week at JIS, in part due to the hard work and leadership of the Senior students. 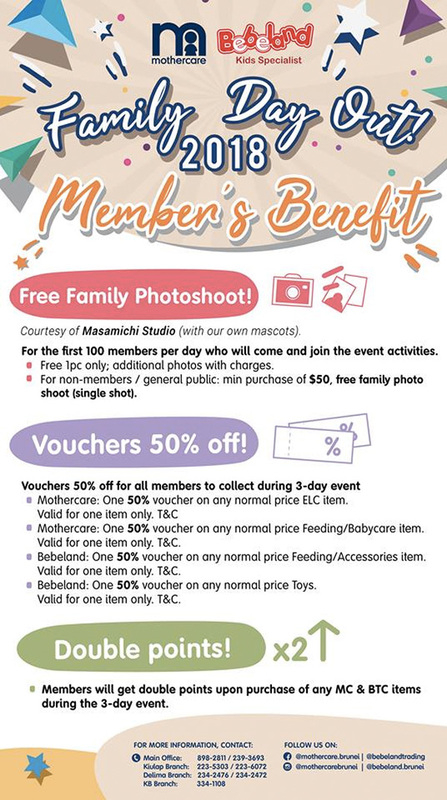 Seeing everyone working together to raise money for charity is inspiring and it reminds me that genuine education goes well beyond the classroom. 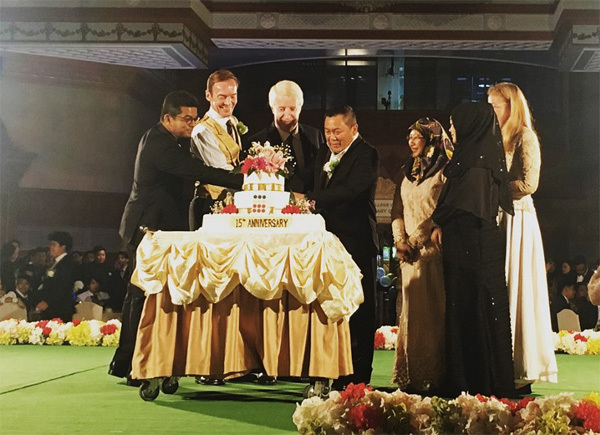 Where more appropriate to focus on International Day of Peace than in Brunei Darussalam – the abode of Peace. It reminds us to value the blessing of living in such a beautiful country of peace. 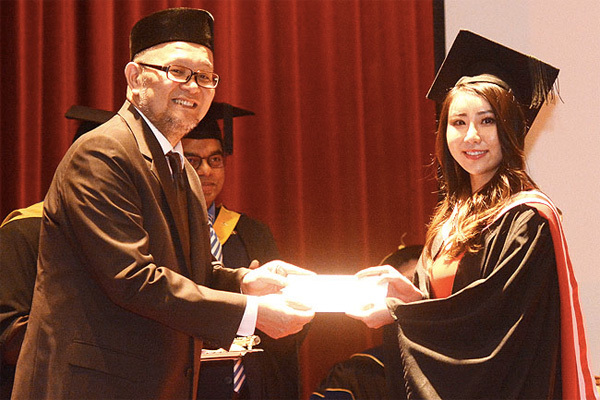 Yang Berhormat Dato Paduka Awang Hj Hamzah bin Sulaiman, Minister of Education, handing out first class honours to Joanne Yen. 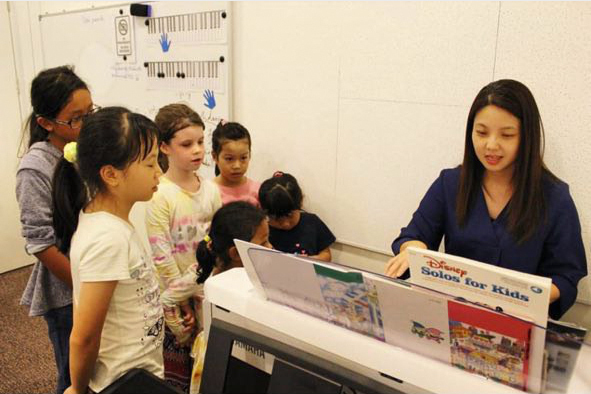 She said that she dedicated her time for studies and paying attention in lectures are important. 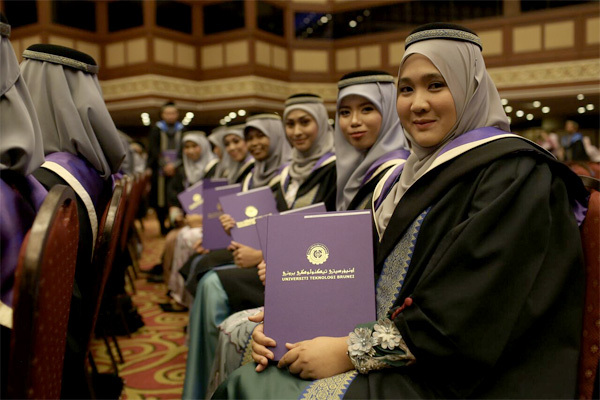 She’s also happy with the lecturers and the facilities. 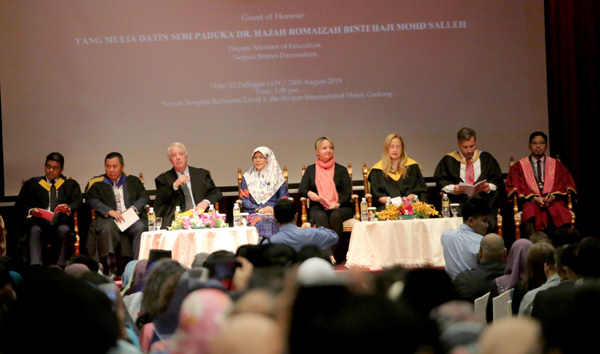 Image taken by James Kon of Borneo Bulletin. 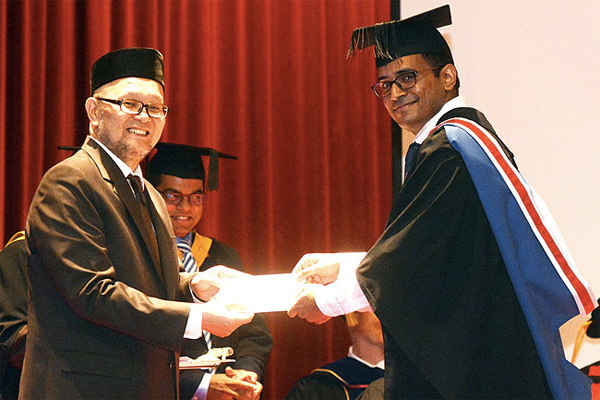 Ivan Ninan is also one of the first class honours recipients of the Chester University. 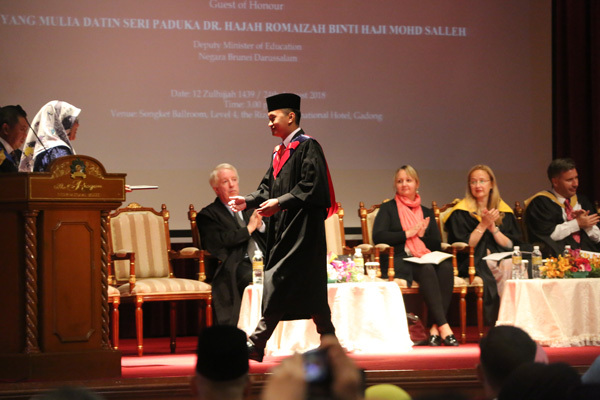 Image taken by James Kon of Borneo Bulletin. 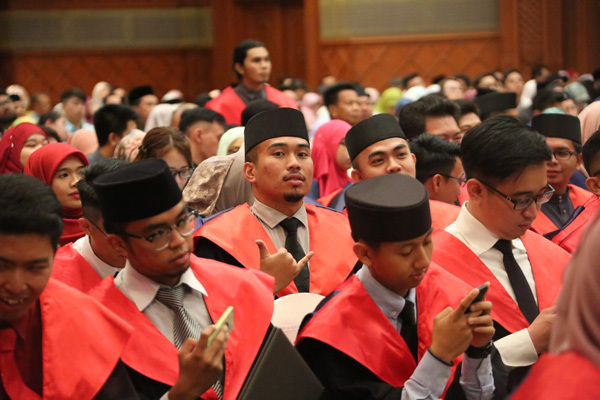 Laksamana College of Business (LCB) recently held two graduation ceremonies, one for the University of Chester UK degree students and the other for BTEC Programmes, University Foundation Course and Kensington College of Business (KCB) Programmes Students. 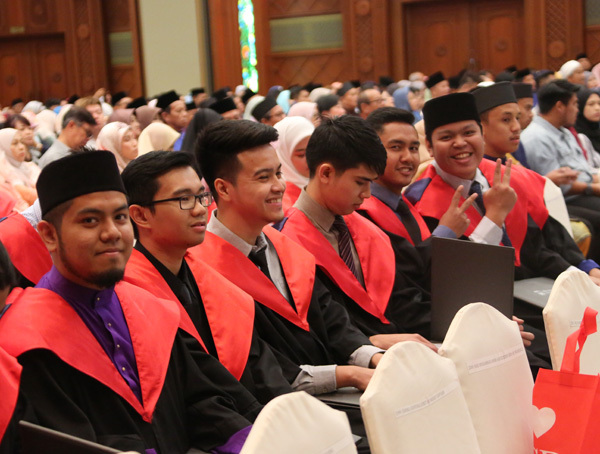 A total of 103 graduated from the Chester University courses while over 400 students graduated from the other courses in LCB. 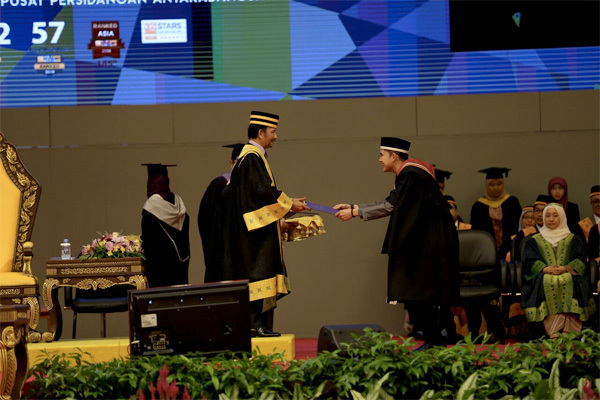 The first graduation ceremony was graced by the Minister of Education, Yang Berhormat Dato Paduka Awang Hj Hamzah bin Sulaiman. 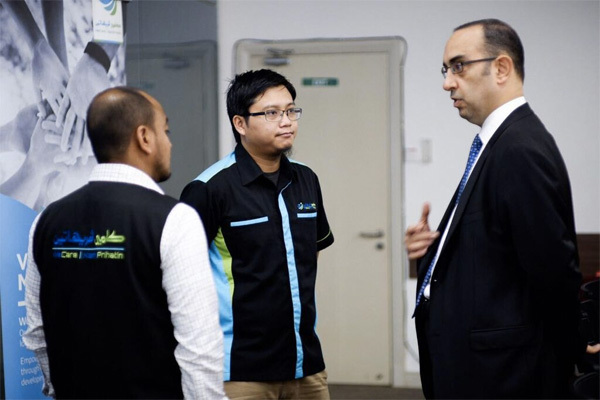 Also present were Mr. Ian Pirie, Principal Director of KCB/LCB, Awang Hj Suhaimei bin Hj Awang Besar, Director of LCB and Mr. Sivarajah Subramaniam, CEO and Deputy Principal of LCB. 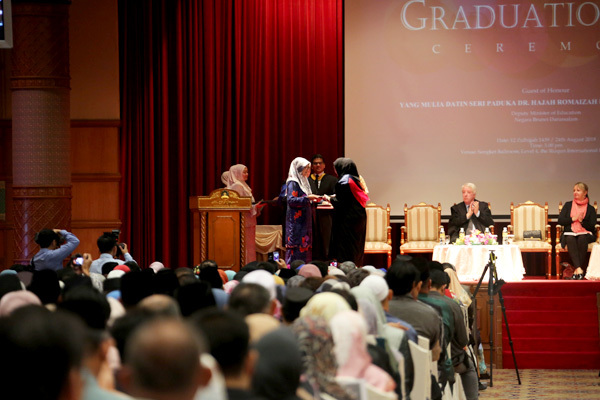 The second graduation ceremony was graced by Datin Seri Paduka Dr. Hjh Romaizah bin Hj Mohd Salleh, Deputy Minister of Eduction. 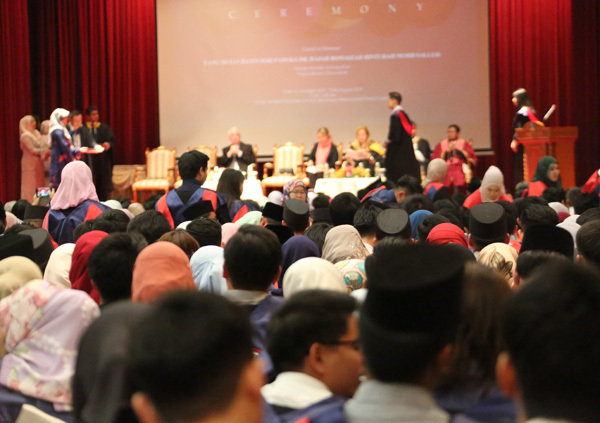 In the Chester University program, 11 students received first-class honours. Ian Pirie mentioned of a new programme during his welcoming remarks. In September, LCB will open a new culinary school and launching to new degree courses in Hospitality and Tourism. 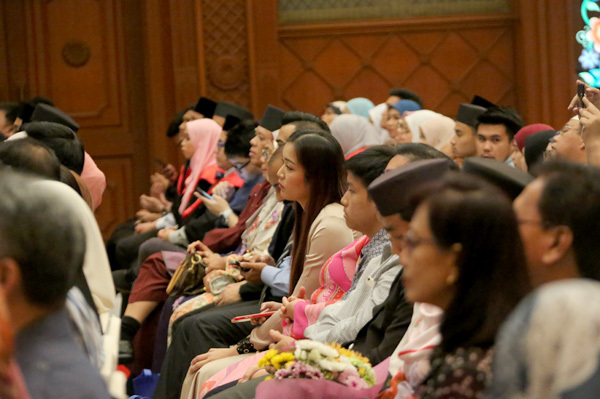 Speaking of culinary, there will be a first Brunei young chef competition. Interesting. 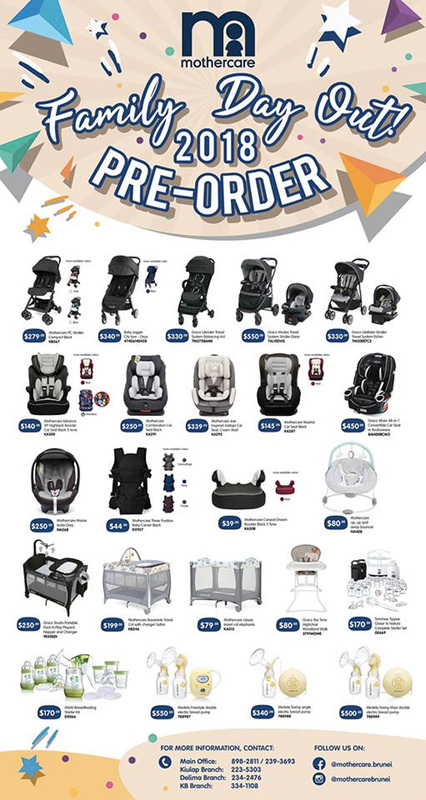 These courses are introduced due to the rising demands. 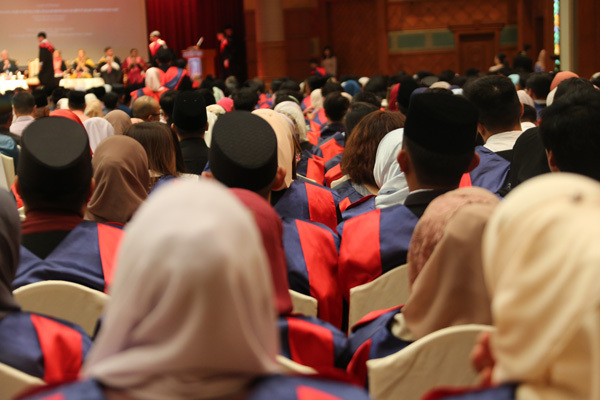 He also mentioned of new Masters and first degree level courses in Computing, Finance and Management in response to the increasing need for computing staff. 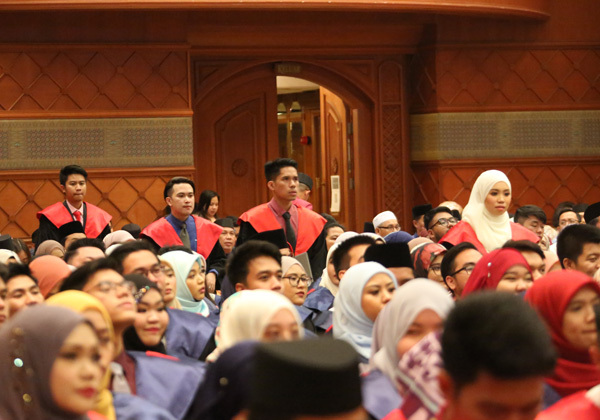 He believed the LCB Student Council has played an important role for the institution. 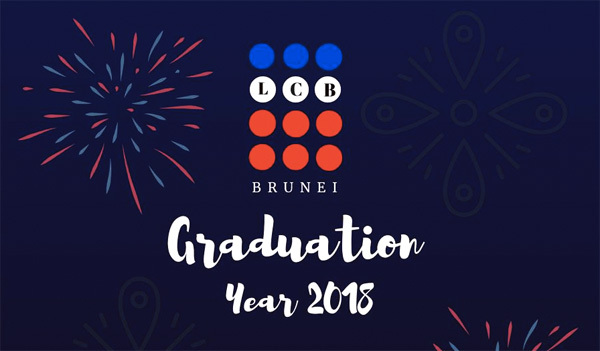 They have assisted in the Graduation ceremonies and also LCB 15th year anniversary celebration apart from the sports and social events. 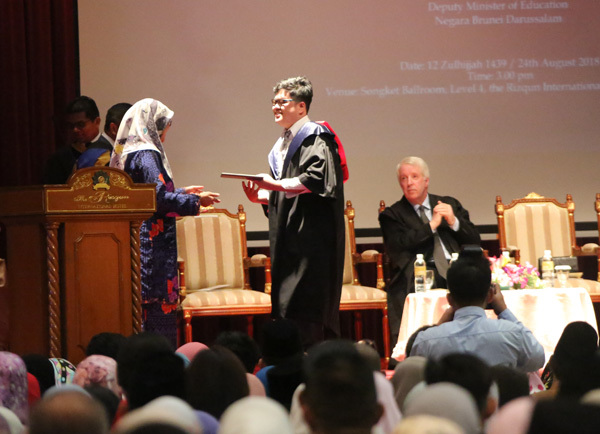 He thanked both Zara and Saufi, outgoing President and Vice-President of the Student Council for their contribution. So LCB has been impressed in building their reputation. 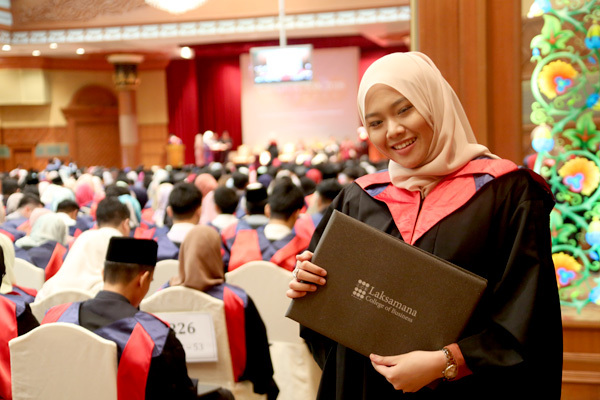 Ever since year 2003, they have over 4,000 students who have graduated and completed their courses at LCB. I remember visiting the premises when it only had limited space and now LCB have expanded and upgraded their facilities to cater to the growing demand of students. Rules of Survivors attracted more than 70 teams if I am not mistaken. Each team consists of 4 gamers. 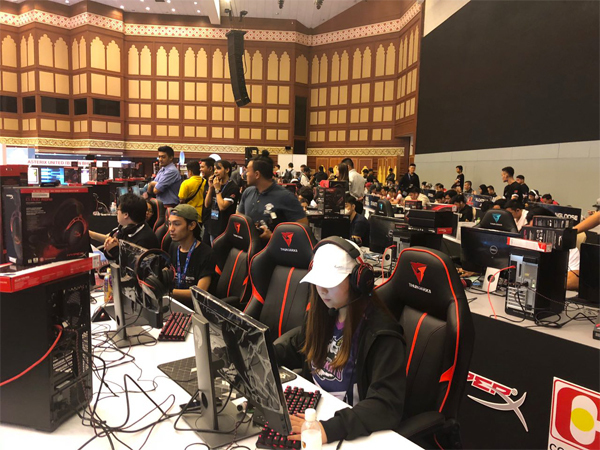 This year’s TechXpo Cyber Games Tournament 2018 is the biggest e-sports tournament of all time with a record prize pool of BND15,000 worth of cash prizes to be won across seven games: the PC games – CS:GO, League of Legends and DOTA 2; console games – Tekken 7 and FIFA 18; and mobile games – Mobile Legends and Rules of Survival. 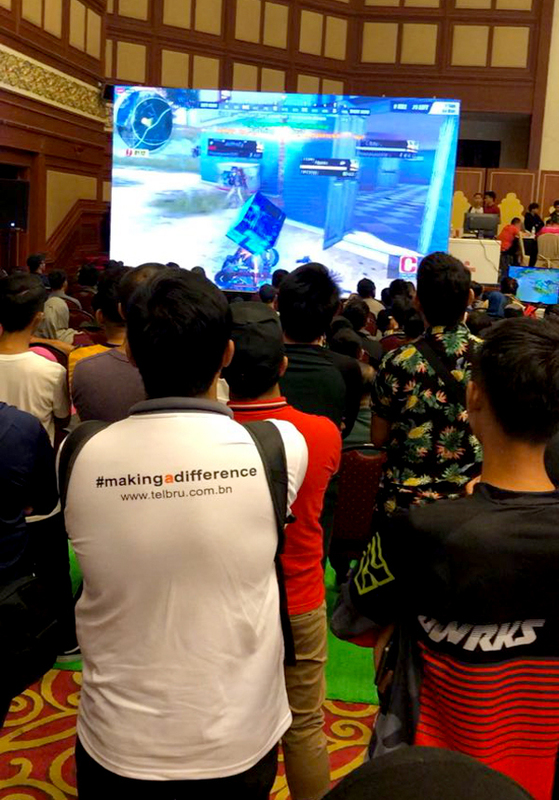 There are local gamers as well gamers from Sabah and Sarawak except for the Counter Strike:GO, which was only open to Brunei citizens and residents. 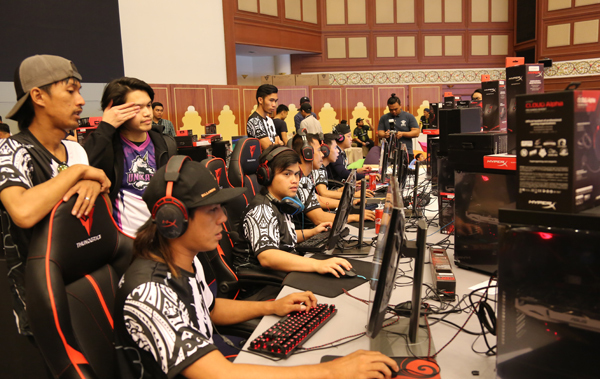 The champion of the CS:GO will walk away with a cash prize of BND2,088, while the first and second runner-up winners will receive the respective cash prizes of BND1,288 and BND888. 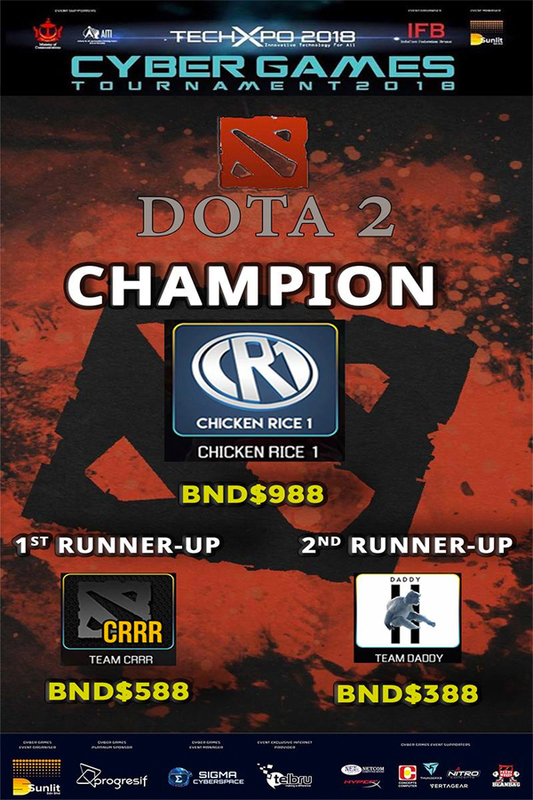 In DOTA 2, the prizes are BND988 for the champion, BND588 for first runner-up, and BND388 for second runner-up. Chicken Rice 1 from Malaysia was crowned the champion while Team CRRR and Team Daddy came second and third respectively. For League of Legends, the champion will walk home with BND1,388, the first runner-up with BND888, and second runner-up with BND588. The champion of FIFA 18 will win BND488 in cash, with BND388 for the first runner-up and BND288 for the second runner-up. 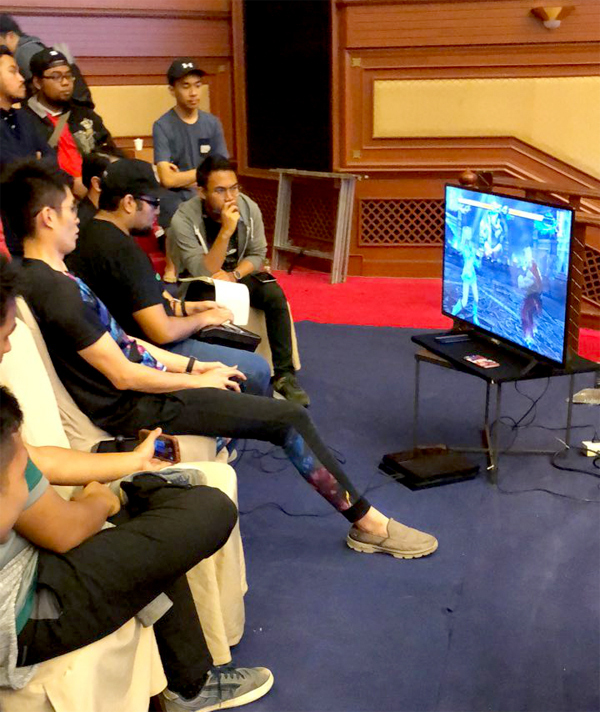 In Tekken 7, the champion will walk away with the cash prize of BND488, first runner-up with BND388, and second runner-up BND288. 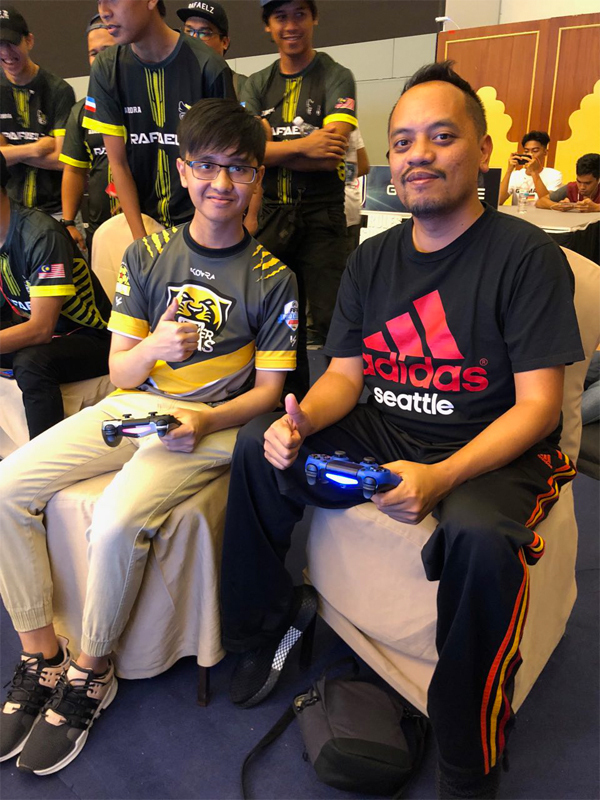 As far as I know, our local player Ivan Pang was victorious as he claimed the honour of being the Tekken 7 Champion. 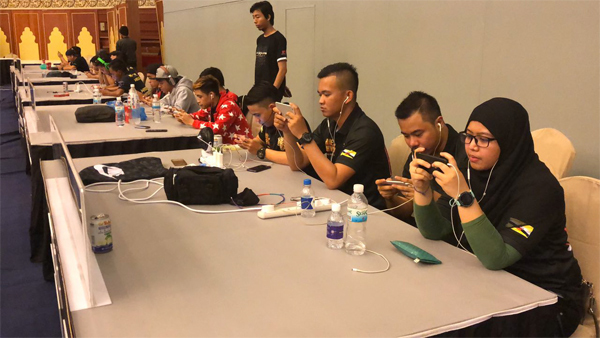 In the mobile games category, the Mobile Legend champion will win BND800, first runner-up BND600, and second runner-up BND400. For Rules of Survival (RoS), the champion will win BND1,000 and 10,000 Diamonds, the first runner-up BND500 and 5,000 Diamonds, and the second runner-up BND250 and 2,000 Diamonds. Third to fifth-ranked winners of Rules of Survival will be awarded with 1,000 Diamonds, while those in sixth to 10th place will get 500 Diamonds. Of all the games, RoS has the biggest engagement among spectators during the Cyber Games tournament. 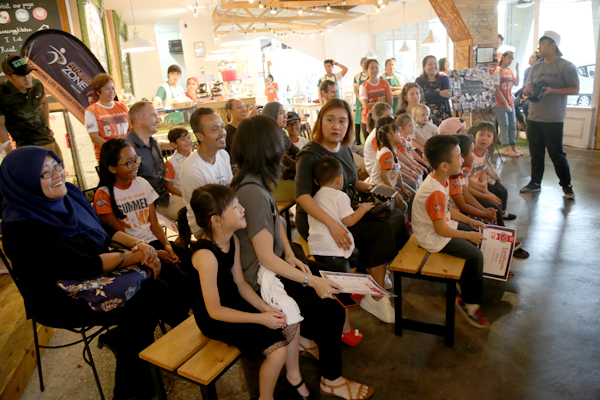 The match is projected on a huge screen for spectators to watch and it is also being live casted by Kenneth Khoo. 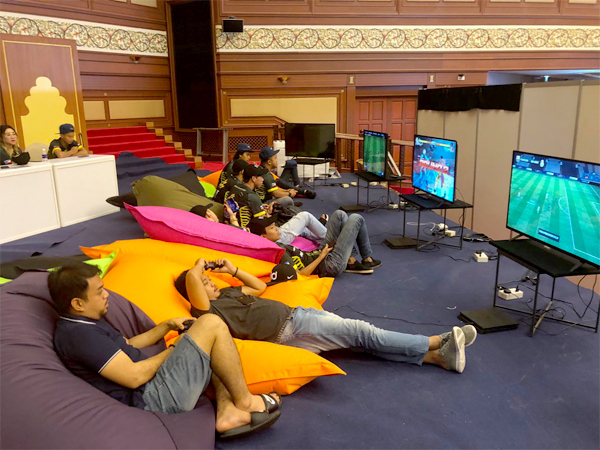 A record pool of BND15,000 worth of cash prizes are to be won across seven games in which over 100 teams are competing in PC Games (CS:GO, League of Legends, and DOTA 2), Console Games (Tekken 7 and FIFA 18) and Mobile Games (Mobile Legends and Rules of Survival). The Cyber Games Tournament is organised by D’Sunlit while Sigma Cyberspace and BruGames are the co-event manager. The Platinum Sponsor for the event is Progresif. 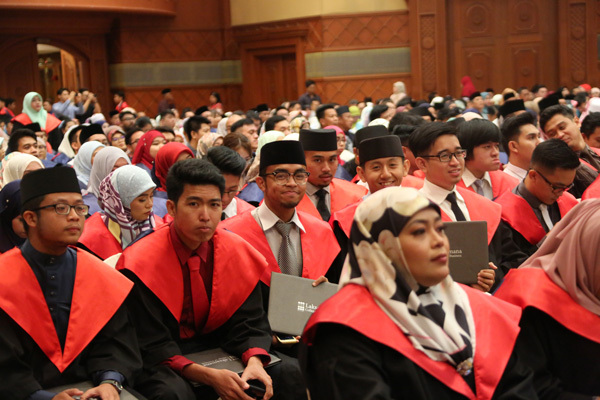 Alif Akmal and I were in the same group. He beat me handsomely 5-1 and I ended up winless in the group stage. 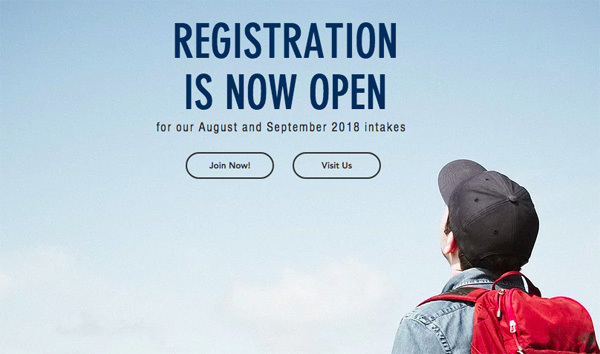 Are you ready for TechXpo 2018? 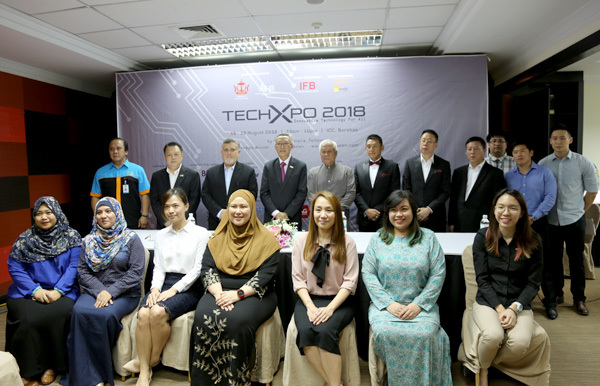 The TechXpo 2018 is just around the corner. A few more days to be exact. 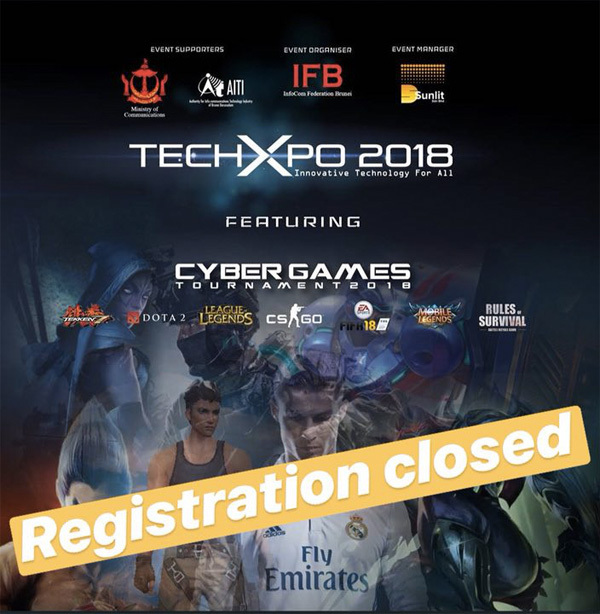 The highlight of the TechXpo is definitely the TechXpo Cyber Games Tournament, jointly organized by D’Sunlit and Sigma Cyberspace where Progresif will be the title sponsor. 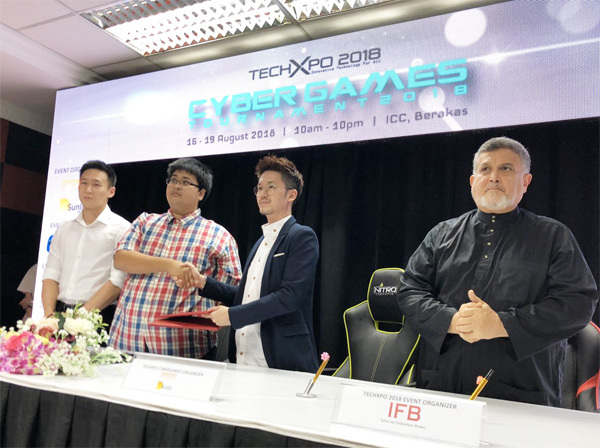 A record pool prize of BND 15,000 is slated to be the biggest yet for Brunei cyber tournaments, featuring games such as Counter Strike, League of Legends, DOTA, Tekken 7, FIFA 18 (which I am joining) as well as Mobile Legends and Rules of Survival. All the registrations have been closed for now and there are more than 300 participants already that have signed up for the tournament. 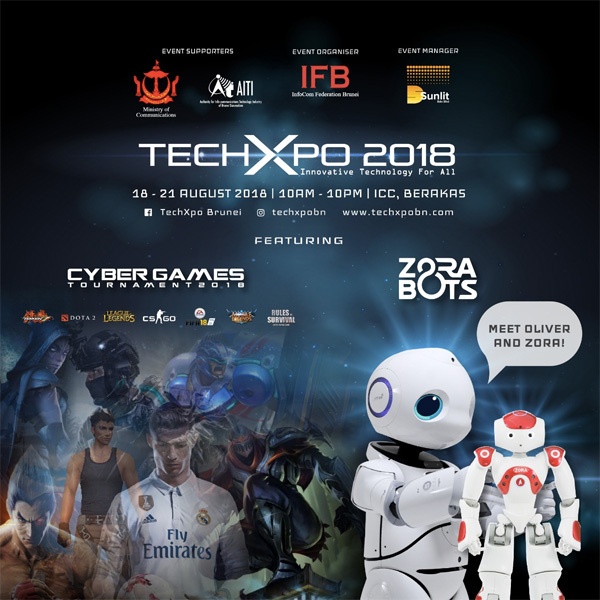 Another highlight for the TechXpo are the robots, all the way from Belgium known as Zora Robotics NV (ZoraBots), a pretty interactive humanoid robot for the public to interact with. 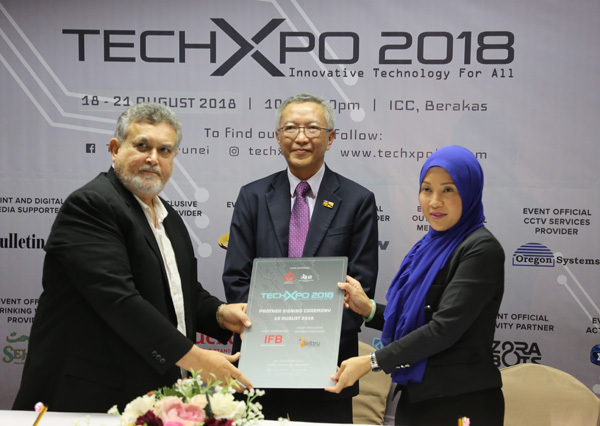 The theme for this year’s TechXpo is “Innovative Technology for All” as the Chairman of InfoCom Federation Brunei, Sheikh Hj Abas, said that everything we do nowadays are linked with technology, even with food. 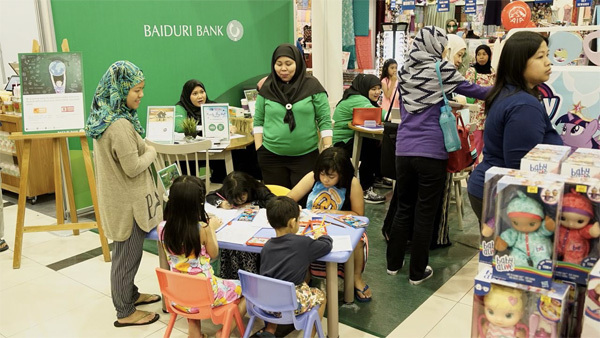 Hence, the theme suits to attract crowd of all ages. 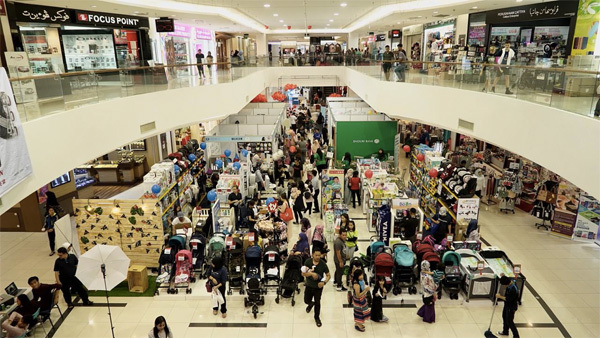 The Plenary Hall will be used for the upcoming TechXpo and do check it out as they will be special offers from participating vendors. 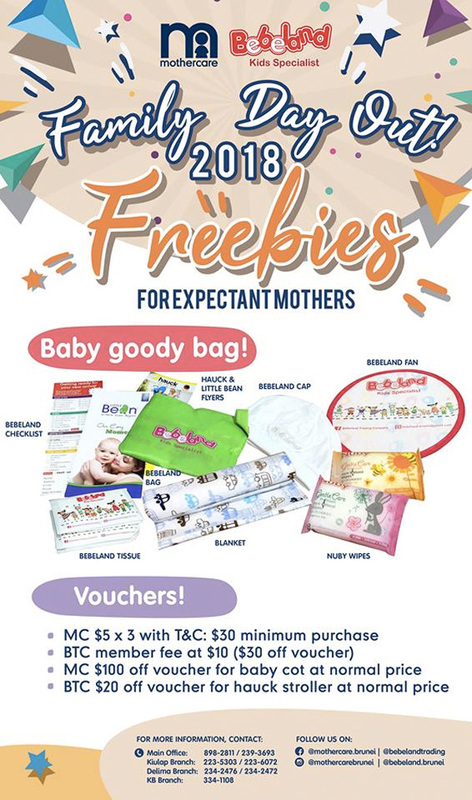 The event will take place this Friday 18th August and ends on 21st August 2018. Oh yea, if you are keen to try out the latest Samsung Galaxy Note 9, you can check out the demo unit at DST booth during the TechXpo before the official launch next week. 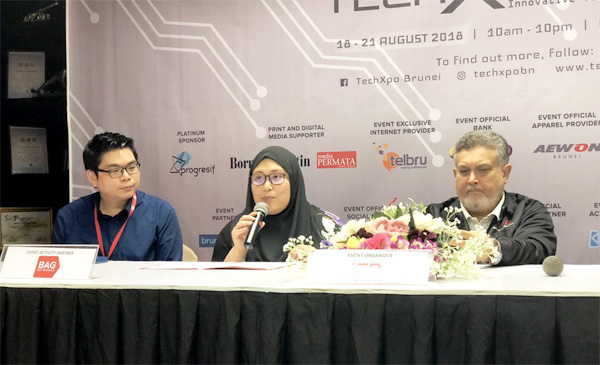 The TechXpo 2018 is organized by InfoCom Federation Brunei and D’Sunlit. 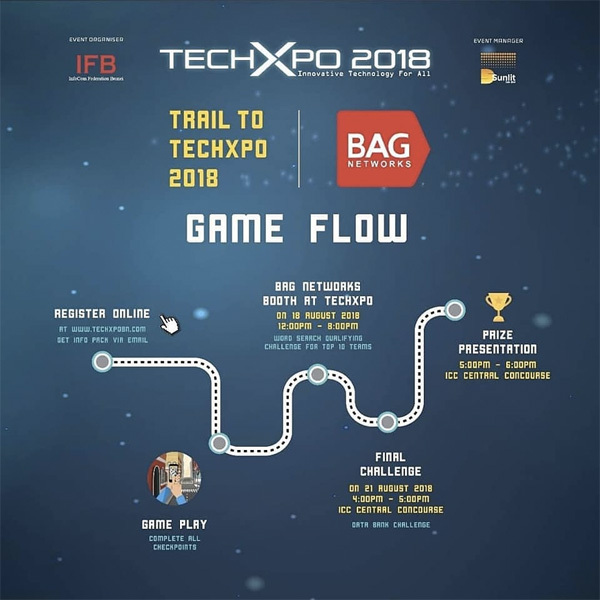 After a huge success for the first trail game (Epidemic: Race to Rescue), BAG Networks have launched the second edition, an augmented reality mobile game which will take place during the upcoming TechXpo 2018. 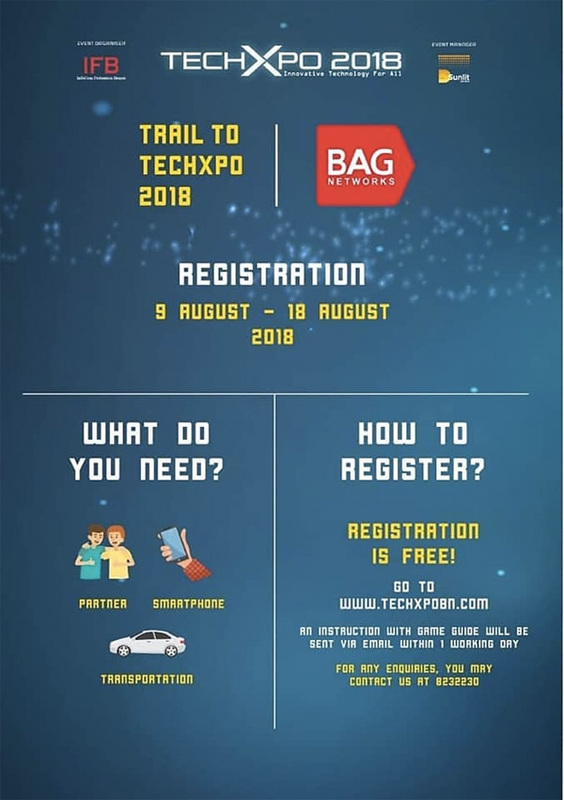 Dubbed the “Trail to TechXpo 2018”, registration has already been opened for all of you to participate leading to the upcoming event. 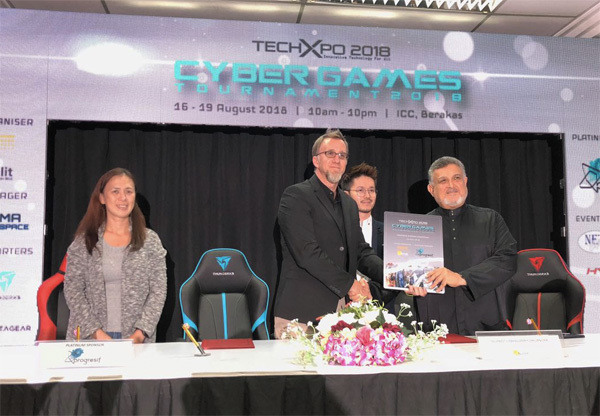 The new game utilizes both GPS and AR technology with the help of your smartphones as you gather clues around Brunei-Muara district and the end point will be at TechXpo event itself at the International Convention Centre. 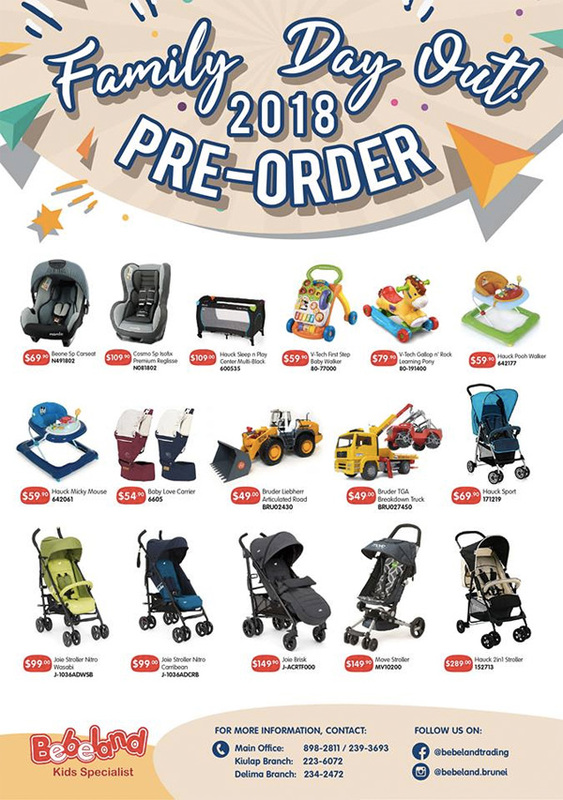 The prizes were not announced yet but the prizes will be sponsored by DST.